I'm lying, there is no problem with Target...that's the problem! Affectionately called the "$100" store because even though you THINK you are just going for dog food, somehow you come home with a new sheet set, a wreath for your front door and the latest DVD the kids didn't even know they wanted. The second those shinny red doors automatically opened and the smell of Starbucks reminds you of how great it is to spend money at Target , all shopping list's go out the door! Kind of sounds like Im putting Target down, in reality I truly am in love with that store! Its my go to, I feel safe there, I know where everything is, people know me there. OK, actually no one knows me there, but you get the point. Target is perfect for subtly letting you know what colors and accents are "IN" for the moment. Take these couple of pics I snapped the other day while I was shopping for "dog food". I'm not saying change every faucet or door knob in your home to Gold, I do feel like Gold is a fad that may leave soon... but, that's why Target is so great! You can buy a stack of cute boxes or a pretty accent table or some cool frames, swap them in for the black and wood ones you already have and voila! You are more up to date then you were 5 minutes ago. Lighting is also easy, change out your lamps , lamp shades and even your hanging pendents to some pretty Gold accented ones that yes, are also available at Target. Oooops, sorry....lets get back to Gold shall we? So , there you go. 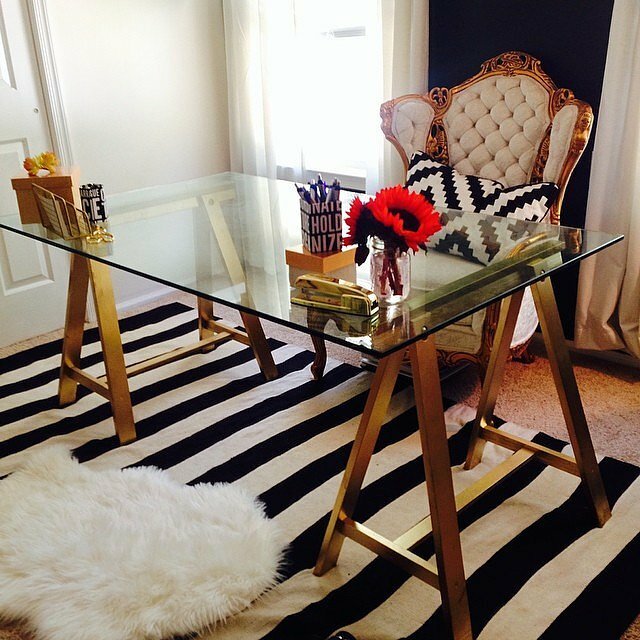 Adding a little Gold or aged Brass is such a great idea to update any room in your home. Start adding in small amounts and see what you think, you just might surprise yourself. In the mean time, here are some more examples of how lovely Gold really is. Hope your day is Golden!